The desperate parents of a boy whose head hangs at a 180-degree angle have admitted they would rather he died than continue to suffer. 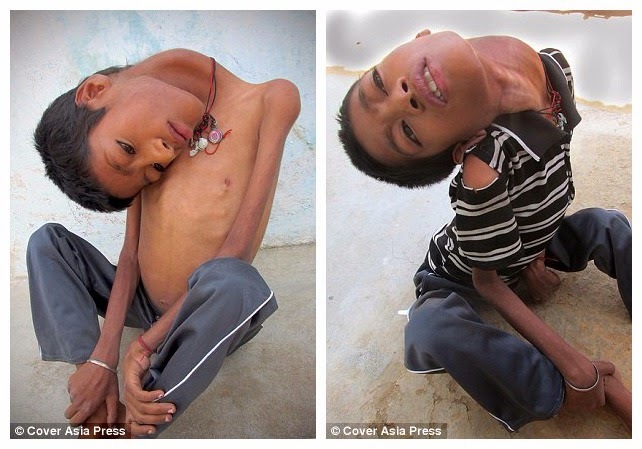 Mahendra Ahirwar, 12, from Madhya Pradesh in central India, suffers from a rare condition that makes his neck bend and his head hang from his body. His weak backbone means he can't stand or walk and is restricted to a sitting position. Mahendra can just about crawl but needs help to eat and go to the toilet. There are indications that the All Progressives Congress is uncomfortable with the May 28 handover date proposed by the out-going administration. Investigation by Saturday PUNCHrevealed that the outgoing President Goodluck Jonathan and the President-elect, Gen. Muhammadu Buhari (retd.) are set to clash over a proposal by the Jonathan team to hand over the mantle of leadership to Buhari on May the 28th, instead of the 29th. Saturday PUNCH gathered that the Buhari team was already over what they considered as an act of ill-will laced with sinister motives. 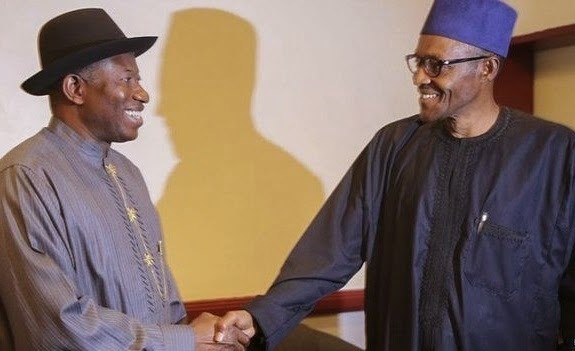 This is sequel to an announcement by the Minister of Information, Senator Patricia Akwashiki, that President Jonathan would perform the handover ceremony at a dinner on May 28. A wife has been accused of killing her husband and father of her three children(one of them pictured right) in Lagos State but claimed it was suicide. The deceased, Seun Olafare(pictured dancing with the wife, Busayo) graduated from University of Lagos in 2006 where he read pharmacy. 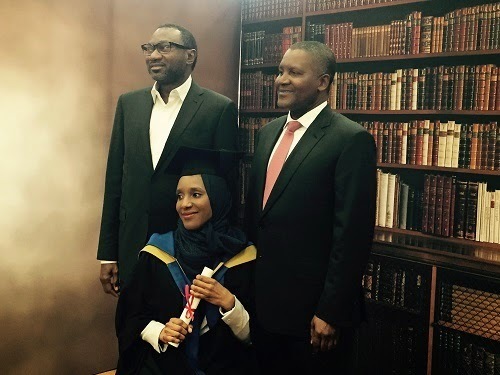 Information gathered indicates that he got married February 19, 2011 to Busayo Taiwo, and the marriage was blessed with three children. However, on Sunday, April 12, 2015, Seun’s death, which occurred in the morning in controversial circumstance has polarized his family and that of his in-laws. Osa Alohaneke, a Nigerian living in the US is accused of killing his fiancee, Evelyne Ebane Epiepang, a Cameroonian and wounding her sister in a double stabbing at their Mission Bend home. The 56-year-old(pictured with his late fiancée) perpetrated the dastardly act at their home in 16300 block of Alametos Drive. The suspect told police that the victim, was his fiancée and that they lived at that address. 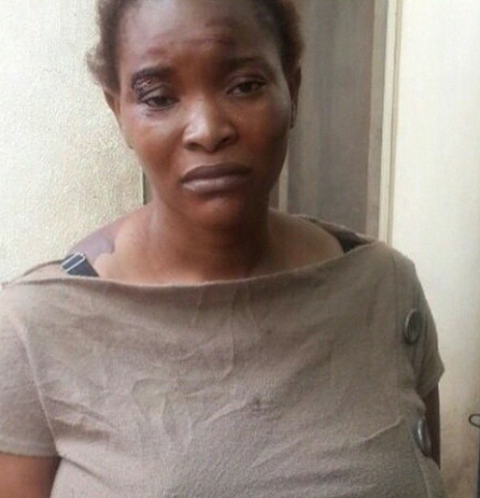 The 56 years old named Osa Alohaneke, has joined the club of wives killers. He is now in police custody facing murder charges after stabbing his 52 year old Cameroonian fiancee, Evelyne Ebane Epiepang, to death at their home in Fort Bend County, Texas on Wednesday April 8th. Sad day for the fashion world, and an even sadder one for the guys-ogling-hot-chicks world -- Gisele Bundchen has walked her final runway ... at 34. The modeling legend -- whose career earnings are reportedly near $400 million -- hit the catwalk for Colcci during São Paulo Fashion Week in her native Brazil. She's gonna keep working in the modeling biz, but says she's done strutting for pay. Hubby Tom Brady, her parents and sister all sat front row for the show. Tom posted a disgustingly drippy love letter to his missus about her accomplishments and inspiration, and blah blah ... but best of all he ends it with, "I can't wait to see what's next. I love you. ?#‎GOAT?" As long as we remember her in our hearts, she'll never really be gone. Plus, there's still old Victoria's Secret catalogs. She became a model at the tender age of 14. And after achieving global success as one of the world's most famous supermodels, Gisele Bundchen took one last strut down the catwalk on Wednesday. The 34-year-old beauty - who has announced she's retiring from the runway - was seen walking for Colcci during São Paulo Fashion Week in her native Brazil, wearing a selection of summery ensembles. “Lawrence is my friend; we grew up together and have lived in the same environment from as far back as I can remember. “On that day, I was just not in the mood to talk with him. When I came out in the morning, he tried to make some jokes, which we would ordinarily laughed about. But I told him I was not interested in such. The president elect has issued a red card to serving top government officials who in recent times besieged his residence in Daura, Katsina to lobby for retention of their positions. Buhari, was livid last week when the current Comptroller-General of Customs, Abdullahi Dikko Inde, visited his residence in Daura to pay homage. Reports according to sources say the customs boss who coincidentally hails from, Musawa Local Government Area, Katsina state immediately after informing the President-Elect of his mission was advised to go back to his duty post. If you're the type of person who's always losing your phone, it's now really easy to find it again -- if you have an Android. Thanks to a new update from Google, you just have to type "find my phone" into Google Search, and it'll show you where it is with startling accuracy. It can also make your phone ring if you still can't figure out exactly where it is. An Indian dad has said he will sell a kidney to get treatment for his three morbidly obese children. Sisters Yogita, five, and Anisha, three, and their 18-month-old brother Harsh, weigh 5st 5lbs (34kg), 7st 8lbs (48kg) and 2st 5lbs (15kg) respectively. They are among the world’s most obese children. They are so overweight they are unable to walk and the food they eat in a week is enough to feed two families for a month. Fresh facts have emerged on the March 31 attempt by a former Minister of Niger Delta Affairs, Elder Godsday Orubebe, to scuttle the announcement of the March 28 presidential election results. The main part of Orubebe’s action, according to Reuters on Thursday, was a plot to use hired thugs to kidnap the Chairman of the Independent National Electoral Commission, Prof. Attahiru Jega, and consequently stall the electoral process. The news agency quoted unnamed pro-democracy advocates and a Nigeria-based diplomat as saying that one of Jega’s aides unearthed the plot. Senator-elect, Prince Buruji Kuruji has responded to Associated Press report on his alleged drug indictment in the US published today titled - Man indicted in US for drug deal elected Senator in Nigeria. The politician and businessman insists he was not the man indicted. His response below..
1. My attention has been drawn to a syndicated report by Associated Press (AP) entitled “A man indicted in US for drug deal elected senator in Nigeria”. 2. First, it should be noted that this is part of a renewed campaign of calumny and propaganda that I have anticipated and I am prepared for. An Ohio woman discovered that her biological mother worked at the same company as her and lived only six minutes away. The Ohio Department of Heath released birth records for people born between January 1, 1964, and September 18, 1996, last month, allowing people their first access to the information. After receiving her records in the mail, La-Sonya Mitchell-Clark, 38, of Youngstown, finally got the answers she's wanted almost her whole life. She looked up her mother's name, Francine Simmons, on Facebook and found out she worked Infocision - the same call-center operation company she works at. The warmer weather appears to have gone to some people’s heads. This couple didn’t mind getting down and dirty in playing fields in Crawley, West Sussex, yesterday. An office worker took the picture of the pair in Three Bridges playing fields and they were at it for over half an hour. Pictured are President-elect General Muhammadu Buhari and his former VP candidate, Pastor Tunde Bakare during a congratulatory visit by the latter in Kaduna on Thursday. Kaduna state governor-elect, Mallam El-Rufai was also present at the meet. Pastor Bakare has reportedly been named by Buhari as the chairman of the transition committee ahead of next month's handover. . Muhammadu Buhari and Pastor Bakare ran for the 2011 presidency as presidential and vice-presidential candidates respectively on the platform of the All Progressives Congress (APC) which they lost. Dramatic dashcam footage has emerged of the moment a police officer rammed an armed suspect deliberately to stop a crime spree. Mario Valencia is facing many charges including assault on a police officer and stealing a rifle from a supermarket. 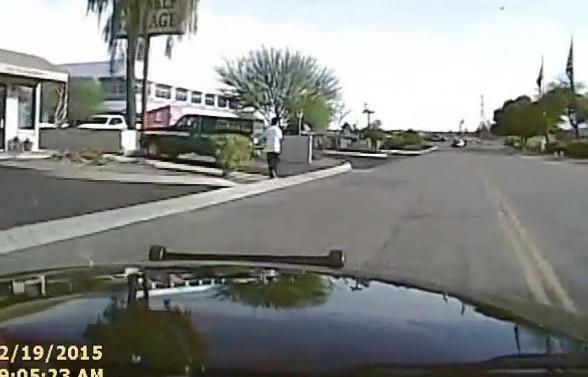 He survived the crash and the police driver in Tuscon, Arizona, was cleared of any wrongdoing. The video released Tuesday and now getting attention across the U.S. comes at a time of heightened tension over the use of force by police across the country. 10 Nigerians are feared dead after angry South Africans launched a xenophobic attack on African migrants in Johannesburg on Friday April 10th. According to reports, 5 Gabonese, 10 Somalis and 5 Congolese students were also killed with some of their bodies set ablaze during the attack. Tinubu Is My Role Model Says - “Truth be told, men like you are rare to come by in every generation"
A chieftain of the Peoples Democratic Party in Ogun State Chief Buruji Kashamu, says the National Leader of the All Progressives Congress, Bola Tinubu, is his role model. Mr Kashamu who is also a Senator-Elect of Ogun-East senatorial district and chairman of the Organisation and Mobilisation Committee of the PDP in the South-West, made this known via an open letter. He described the former Lagos State governor as a true hero to be emulated by every Nigerian. In the open letter addressed to Tinubu, Kashamu said, “Truth be told, men like you are made up of sterner stuff and are rare to come by in every generation. A mermaid-like baby has been delivered at the Suntreso Government Hospital in Kumasi, Starrfmonline.com has reported. The child with a rare defect has only one leg joining the torso from the waist down to the two feet – also conjoined at the heels to look like a caudal fin. Two men have been jailed after they were caught fleeing the scene of a callous burglary in Croydon. Shaun Bryan and Gino Sawyers entered an address in Northcote Road where they threatened two women, aged 25 and 33, with violence and stole their mobile phones, a laptop and cash before absconding from the property. When officers arrived they swiftly activated a mobile phone tracking app which traced Bryan and Sawyers to London Road. Police Officers Respond to Special Delivery And Helped Deliver a Baby Boy After Being Flagged Down by the Father-To-Be. Two quick-thinking police officers helped deliver a baby boy after they were flagged down by the father-to-be. PCs Paul Howarth and PC Anna Drake were on a routine patrol in Manor Park Road, Harlesden, when they noticed a man frantically running towards them after his wife had gone into labour in the back of their car. “FISH RAIN” IN THAILAND - Later Day Manner? “Fish Rain” In Thailand Fishes Gets Litters All Over the Streets After Rainfall in Thailand, amid surprise of passersby hundreds of fishes had flown to the banks of seashore and on the road. Most of fishes found dead. It appeared as if Thailand received a Fish rain. Some passersby try to save fish. The rainy season in Thailand varies from region to region. Very broadly speaking, Thailand’s rainy season can be classified as May/June to October. The river fishing season in Khao Sok National Park is influenced by the monsoon winds from both the Indian and Pacific Ocean. Our fishing locations inside Khao Sok National Park consist of 3 big rivers and 4 smaller streams. All are connected with Cheow Lan Lake. The Bungalow on the lake is placed so that gives us a choice of rivers from different catchment systems. Some people say that fly fishing the Jungle Rivers is difficult. We would say that it’s not difficult but it is different. 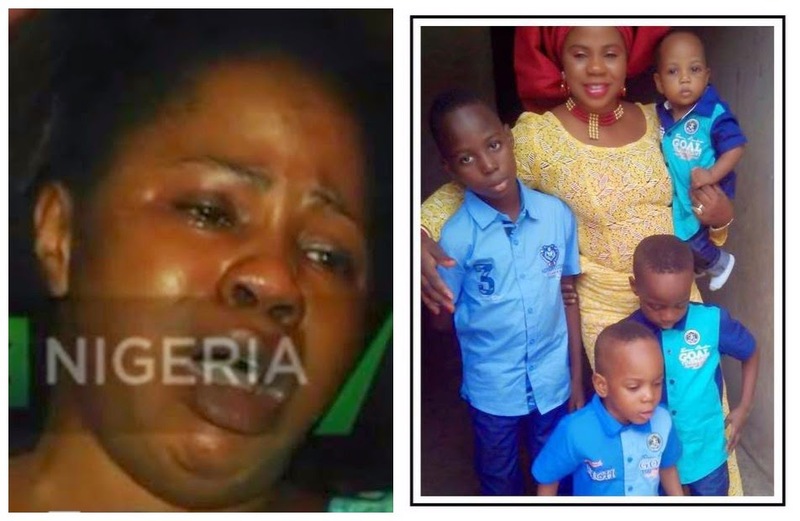 The parents of the three children, who were kidnapped by their nanny, Mary Akinloye, last Wednesday, have lamented their inability to raise the N13m ransom demanded by the kidnappers for the release of their children. Information inedicate that the kidnappers refused to reduce the money, and insisted the ransom must be paid or they would kill the children. A family source, who pleaded not to be named, told their correspondent yesterday Monday that the family was in disarray. The happily married father of three narrated how he met his Onitsha-born wife, Azukaego Kwentoh and why he will spend the rest of his life with her. What’s the secret of your youthful look at 50? married for 26 years People keep asking but I don’t do anything extraordinary. 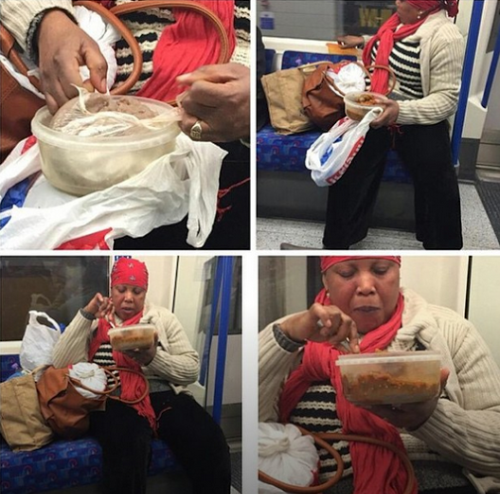 Why I said my wife is because she gives me peace at home. When I think of my home, I am always happy. Nigeria’s President-Elect, Muhammadu Buhari is said to have appointed the General Overseer of the Latter Rain Assembly, Pastor Tunde Bakare to head the transition committee, as he makes his first ever appointment. Buhari at the weekend said only credible, patriotic and knowledgeable Nigerians would make up the transition committee, as part of the first steps to chart an entirely new path for the country. WITH ferocious intensity, the All Progressives Congress (APC), yesterday, swept into its kitty most of the 29 governorship seats contested at the weekend. The huge victory has catapulted the party to the enviable position of the dominant party in Nigeria. Patients will have to take their passport to hospital as part of a clampdown on health tourism. For the first time, hospitals are being told to ensure everyone proves they are entitled to free NHS treatment. Those at outpatients clinics and in A&E will have to fill in forms stating their passport number and expiry date, and say how much time they have spent abroad, if they are to be admitted on to a ward. A driver who crashed his £250,000 Lamborghini into a tree, causing one of the supercar's wheels to fly off, reportedly laughed as he told onlookers he would go out to buy a new one. Martin Johnson, 46, was walking his granddaughter Charly Pennett, aged nine, home from school, when one of the wheels flew past them in Beaumont Leys in Leicestershire - narrowly missing the pair. 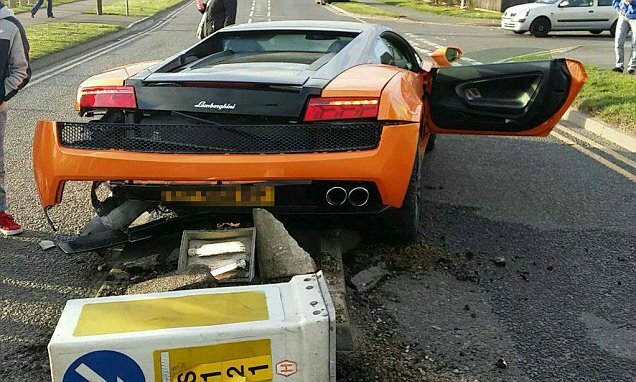 The Lamborghini Gallardo, which can reach 0-60mph in 3.4 seconds, hit a tree before careering into the middle of the road and smashing into a bollard - just metres from Buswell's Lodge Primary School. The lavish royal wedding of the son of the Sultan of Brunei, Prince Abdul Malik, 31, and data analyst, Dayangku Raabi'atul 'Adawiyyah Pengiran Haji Bolkiah, 22, (left) took place at the Istana Nural Iman palace today. The couple exchanged vows in front of friends and family, nobility and international dignitaries at the monarch's 1,788-room palace (pictured right) in Brunei's capital, Bandar Seri Begawan. Nothing was too lavish for the pair, from the gilded throne to the bride's Swarovski-encrusted Christian Louboutin heels and thick gold anklet. Mr Kayode Aderanti, to put security measures in place to ensure the protection of their lives and property after the general elections. The appeal came just as they demanded an apology from Oba Rilwan Akiolu of Lagos over his comment that the Igbo would perish in the Lagos lagoon, in seven days, if they did not vote for his choice governorship candidate in yesterday’s elections. The Chairman, Ohaneze Ndigbo in Amuwo Odofin local government area, Chief Akalika Emmanuel, explained that the call for the protection of life and property became necessary to avoid unforeseen circumstances. A milestone in Nigerian politics is set to be reached with Senator Jummai Aisha Alhassan‘s ongoing victory in the Taraba governorship polls. The victory will make Sen. Alhassan the first elected female governor in the history of Nigeria. According to reports on social media, Alhassan, who represents the All Progressives Congress , is leading the People Democratic Party’s Mr Darius Ishaku. Kaduna State: APC - 725, 293; PDP-242,392. Mallam Nasiru El-Rufai is the Governor Elect of Kaduna State. APC, Ajimobi Leading in Oyo State Election & on Course to be the First Governor to Rule Oyo Twice. This is how Desmond Elliot celebrated his victory into the Lagos House of Assembly on the platform of the all Progressives Congress – champagne or palm wine bath? Collation of results of the governorship elections in Oyo State is still going on but the Peoples Democratic Party candidate, Sen. Teslim Folarin has already conceded defeat. Folarin, in a radio message on Splash FM Ibadan this evening, thanked his supporters and congratulated the eventual winner in advance. Results trickling in from Imo State put the Peoples Democratic Party (PDP) candidate, Emeka Ihedioha in early lead ahead of his main challenger in the governorship election, Rochas Okorocha of the All Progressives Congress (APC). While Ihedioha has put a strong showing in his base, Mbaise axis of Owerri senatorial zone, Okorocha is struggling to battle the onslaught of the PDP candidate into his Orlu stronghold. Okigwe zone appears to be tilting largely in line with the PDP in the elections. 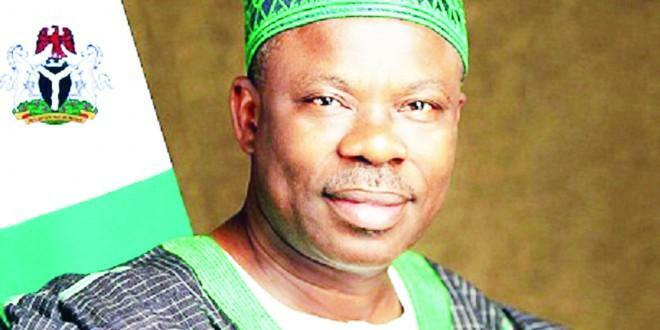 The governor lost at the polling unit in Government house Owerri with a margin of one vote. The PDP polled a total of 58 votes to defeat the APC which scored 57 votes. Similarly the Deputy Governor of the state, Prince Eze Madumere also failed to deliver his booth as PDP won with 533 while he only managed to get 10 votes.